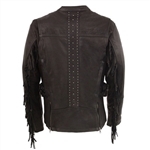 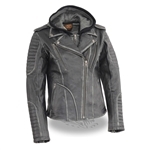 Find the perfect ladies leather motorcycle jacket. 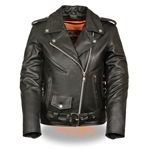 Choose from classic riding leather jackets or sporty scooter styles. 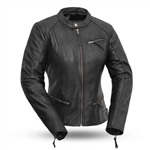 Choosing a motorcycle jacket is never a easy task, if you are in the tri-state area stop in to our New Jersey location to shop our large selection of ladies motorcycle apparel, and let our knowledgeable staff help you pick the perfect riding jacket for your needs, or if your not local order online and get Free Shipping on your order over $79. 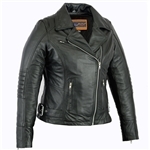 We stock a impressive selection of leather jacket for women in a variety of fits and styles to keep you stylish and protected while you ride no matter what road conditions you may encounter. 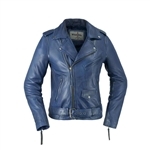 Our selection includes popular brands: First Classics, Milwaukee Leather, Daniel Smart & more! 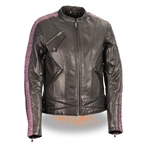 Be sure to check out our selection of ladies textile riding jackets which are a smart alternative to a leather jacket.